It’s only a week away from Christmas and many are getting into the holiday spirit with a little mood music in the form of Christmas carols. While it’s rare to receive a knock at the door and be met with a host of neighborhood carolers in wintertime serenade, many holiday revelers get their Christmas music fix from traditional legends like Bing Crosby, Johnny Mathis and Mel Torme. However, a new tradition has made an indelible mark on the yuletide season that influences all who listen to remember the reason for the season. 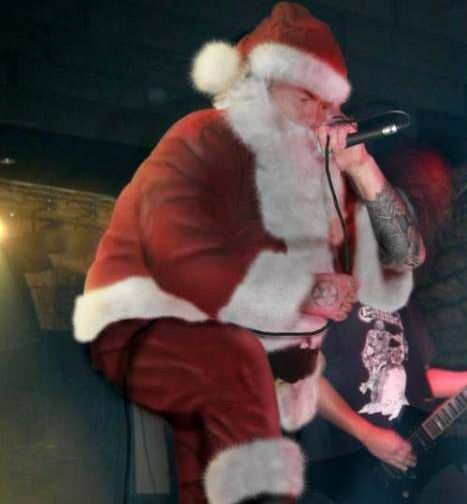 Below is a collection of the best and worst of Christmas hits, made worse by some of rock and metal’s best and worst, for your holiday enjoyment. Also included is, without a doubt, the most awesome Christmas light display in the history of mankind. First up, a look at Dokken (?!?!) and their take on Santa Claus is Coming to Town with a fiendish Santa Claus. After seeing this video, I now know why it can be dangerous to leave a plate of cookies for Santa to consume upon delivery of his payload. Folks, I promised you the bad and ugly side of Christmas carols, and now I deliver to you a heaping slab of wintertime “delight” offered to you by none other than Christian rockers, Stryper. (I can’t believe I am actually posting a Stryper video on my blog; I promise I will make up for it further down the page). To counterbalance the cringe-inducing qualities of holiday music as evidenced by Stryper, thrash metalers Testament attempt to make it right in an anything-but-quiet rendition of “Silent Night.” The accompanying music video is particularly amusing. The late, great Ronnie James Dio passed away this year. In honor of the legendary voice that defined an entire era of metal vocalists and the godfather of the devil horn hand gesture, we present to you his powerful, four minute hymn “God Rest Ye Merry Gentlemen” with Black Sabbath bandmate Tony Iommi. Christmas time provides the opportunity for many to satisfy their creative palates and hidden dreams of a career in Hollywood visual design by decking their houses with millions of multi-color lights, absurd inflatable giant-sized snow globes, and wooden or plastic statues depicting the fabled nativity scene. Most of the time, the end result is a blinding ray of lustful megalomania that doesn’t celebrate Christmas so much as it serves as a glowing beacon to indicate that the inhabitants of that particular home are a gaggle of blithering idiots of the highest order. However, there are extremely rare occurrences where planets align and John Doe from Anytown, USA assembles a Christmas light and decoration extravaganza that exemplifies an emphatic bullseye in holiday season inspiration. Ladies and gentlemen, without further adieu, I present to you the B E S T C H R I S T M A S L I G H T D I S P L A Y ….. E V E R !!! In closing, we wish you all a Merry Christmas and a Happy New Year. This entry was posted in Entertainment and tagged Blood, carols, Christmas, Dio, Dokken, gentlement, god, lightorama, lights, merry, metal, Night, Raining, rest, Santa Claus, Silent, Slayer, songs, Stryper, Testament, winter, wonderland, ye by Troy Beckman. Bookmark the permalink. I still think my favorite part is the cowboy riding the horse while Santa circles him on the scooter.